Just like any food blogger that has been doing this for several years, I find inspiration and motivation for new recipes ebbs and flows. I love it when it flows, no surprise there but when life gets crazy the brain cramping definitely increases. When the imagination is sparking I make lists but sometimes ideas show themselves when you aren’t paying attention. I was in the queue waiting to pay for my weekly food shop and I spied a magazine with a pork dish on the cover. The title for it said Cider Sage Pork. If the magazine wasn’t $10 then it would have left the rack and been perused. But it stayed. I figured I could come up with my own recipe and keep the $10! 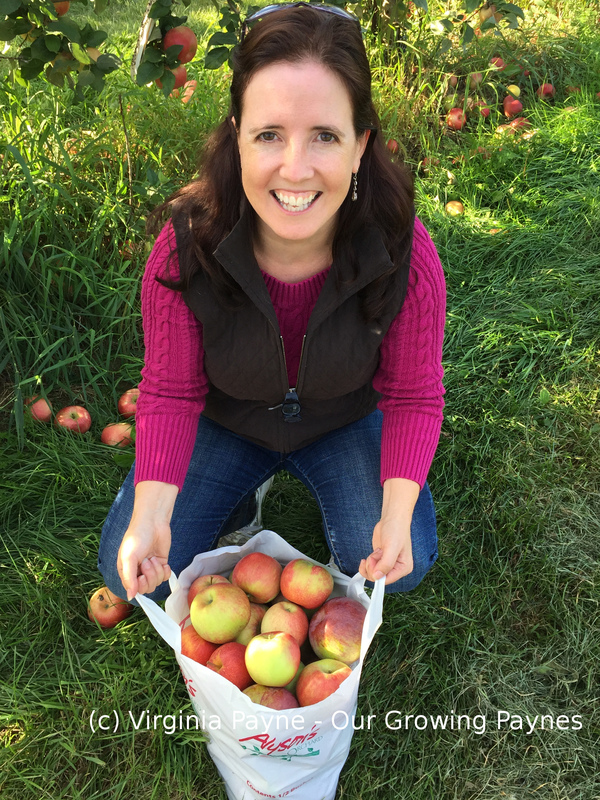 We’re lucky that our co-op carries delicious sweet apples like gala or pink lady. First thing is to prepare the marinade so the pork loin can marinate for several hours. If you don’t have the time, try to marinate for at least an hour. Give the pork a chance to take on the lovely flavours. The cider I used was apple cranberry as there was a special on and I’d thought it would be fun to add the tang of cranberry to this dish. But obviously regular cider works. I should also note, the cider is non-acoholic, not the hard cider. 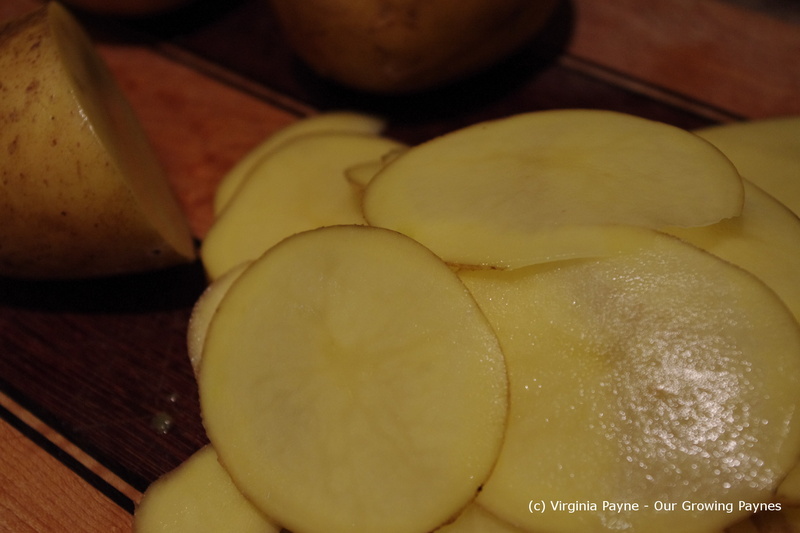 When it is time to cook dinner, finely chop the apple, onion, garlic and sage. Set aside. Pre-heat the oven to 350F/175C. In a skillet, heat up the olive oil and brown all sides of the pork loin. Finish off the pork in the oven while making the sauce. Add the onion, garlic and apple to the skillet. Cook for several minutes until the onion starts to become translucent. Add the remaining marinade and chicken stock. Bring to a simmer and add the mustard, sage and thyme. Season with sea salt and pepper. Simmer the sauce to reduce by a third. When the pork is cooked, remove from the oven and let is rest for 8-10 minutes. To serve, slice the pork loin and top with the sauce. To keep the dish light we had roasted potatoes and corn as sides. I was very happy to find this inspiration while patiently waiting in a queue. I’m definitely keeping my eyes open! 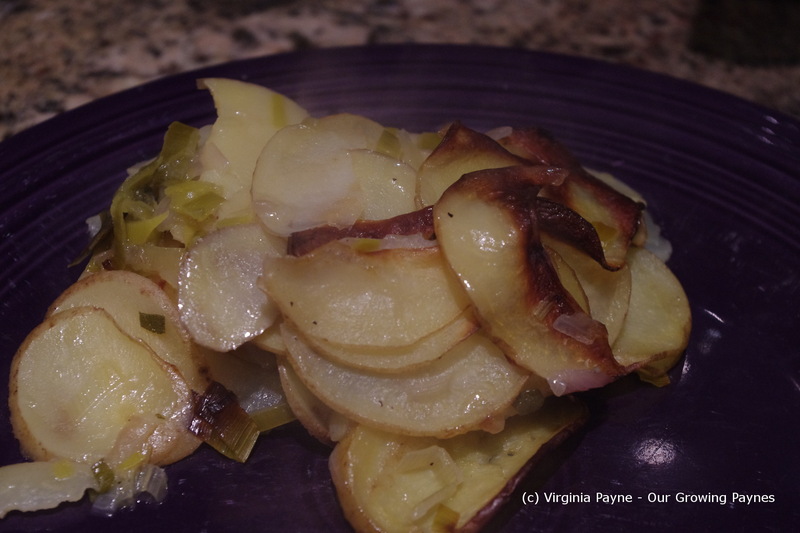 A flavourful pork loin with apple cider, onion, and sage. Mix the ingredients together and marinate the pork for several hours in the fridge. If you are pressed for time, marinate for at least an hour. Preheat the oven to 350F/175C. Heat the olive oil in a skillet and brown all sides of the pork and finish cooking in the oven. Once cooked, rest for 8-10 minutes before slicing. In the skillet with the olive oil used to cook the pork, add the onion, garlic and apple over medium heat. Cook until the onion starts to become translucent. Add the marinade and chicken stock and bring to a simmer. Add the sage, thyme and mustard. Season with sea salt and pepper. Simmer until the sauce reduces by a third. It was a fantastic weekend. It just felt really productive and it was fun to hang out with the kids after our holiday. The meds for the fibro have started to work so I feel like I’m on a roll now. And gathering steam! The weather was perfect and no forecast of frost so it was time to clear out the house of the multitude of seedlings we have growing. It can be hard to time when to start them because we have no idea when the danger of frost has past. It can be the beginning of April or the end of May. We got most of it planted and we’re just left with the tomatoes. I was playing it safe in case the weather people were wrong. Which never happens. Ahem. I was also in crazy baking mode. I found some burratta at the shops and wanted to do an Italian night with the kids so I made ciabatta and chopped up fresh tomatoes to go with the burratta as a starter. I also made brioche and shortbread which I’ll be posting about soon. I flipped through the cookery book that I have by Marcella Hazan and she had a recipe with white wine and sage for pork ribs. I used it as an inspiration though the only two ingredients I used was the white wine and the sage. I had a pork loin to cook for this. We have discovered that my son, who hates mushrooms, is ok with oyster mushrooms. So we found some nice fresh mushrooms to pair with the fresh sage. I chopped enough mushrooms to make up a cups’ worth. I also finely chopped 3-4 cloves of garlic and a handful of fresh sage. In a skillet heat up a couple of tablespoons of olive oil. Season the pork with sea salt and pepper. Brown all sides. Finish it off in the oven at 350F/175C. In the skillet add a bit more olive oil and the mushrooms. Saute for a few minutes then add the garlic. Once the mushrooms have browned a bit add 3/4 cup of dry white wine and 1/2 a cup of chicken stock. Bring to a simmer and add the sage. After the sauce has reduced by a third season to taste with sea salt and pepper. I also made a mash with potato and parsnip. To dish up add the mash and topped with sliced pork and the sauce. I felt the sage was a strong flavour so I would back off the sage a bit for myself but my family all thought different. Funny how taste buds work! We had a lovely Thanksgiving but we delayed it a day because a snow storm blew through the night before the actual holiday. We were lucky because we didn’t lose power but a lot of people did and they were stuck with all that food and no way to cook it. Some got creative and fired up the old grill. As usual we order our turkey from a local farm. Usually we order it from Mayfair Farms a few towns over. When we don’t it’s because I flaked and waited too long. This year I didn’t, I ordered early and asked for a small turkey, about 12-13lbs. Yes, that won’t be a problem, I am on the list! Pat on the back and all. Well, best laid plans and all that because the turkeys turned out to be even healthier and hungrier than planned. Our turkey ended up being 17.56 lbs! Holy moly. So I quickly put out the word to my family members to bring containers. Did any of them do that? Absolutely not. Sigh. As I drove out into the woods to pick up our bird it started snowing and by the time I got to the farm it was really pretty. Craig and Sarah, who own the farm, have been here for a few years now and have really made it into a growing concern which is wonderful. And I was greeted by the “guard” dog who definitely had to check me out. Each year I try to do the turkey a bit differently from the last to keep it fresh so I thought I would do a sage and pear roast turkey with butter. I softened 1/2 cup of butter and worked in a handful of chopped fresh sage. Luckily the turkey still fit into the roasting pan. Not the lid though so I had to use tin foil to cover. Murphy was really hoping I’d screw up somehow and the turkey would magically fly out of the pan and onto the floor. I’ll admit I don’t like this next step of mucking about with raw poultry. I stuffed most of the butter under the skin and what little was left rubbed into the outside of the skin. Season with salt and pepper. I used white pepper because we ran out of regular pepper. 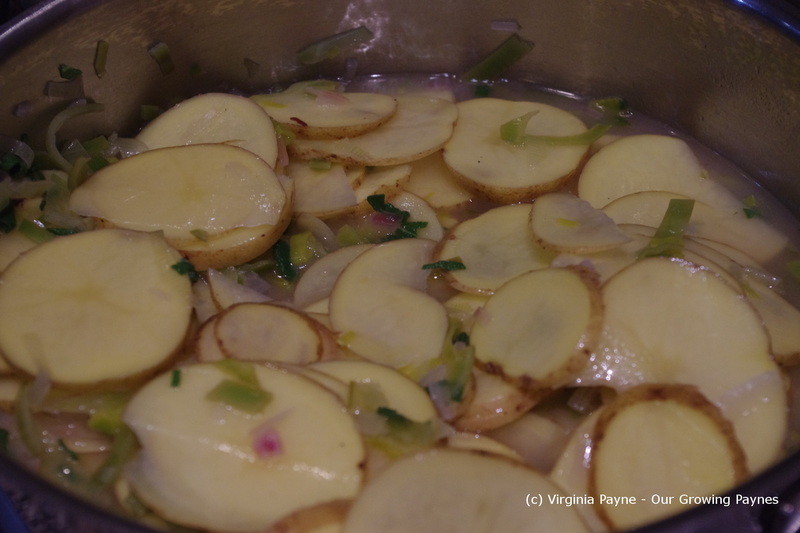 In the basin of the pan add a peeled pear, chopped, half a red onion, a few cloves of garlic, a handful of sage, and a few teaspoons of fresh thyme. Add 1/2 cup of dry sherry, and a couple of cups of water. Cover with tin foil or a lid and begin roasting at 325F/160C. If the turkey is less than 15lbs, cook it 15 minutes per pound, if more than than, then drop it to 12 minutes. This is per the Fanny Farmer cookbook. So our turkey was about 3 1/2 hours. An hour and a half in I basted. When there is an hour to an hour and a half left remove the cover. Normally I wait to the last 45 minutes but because I added so much butter I knew this wouldn’t dry out. Now I love turkey skin and let me tell you this was amazing. Crispy and full of flavour! And because I put in all the ingredients for the gravy at the beginning it is just about made. I put it on the boil and add dissolved corn flour a bit at a time to get the thickness I want. Stir constantly. I usually add a bit of Gravy Master but not too much because I want the subtle flavours of the pear and sage to come through. We did our usual roast veg and I made the stuffing balls I did last year. I also made a fabulous cranberry port sauce. That I forgot to serve. Honestly, all that effort. All well I’ll serve it at Christmas. Of course we had way too much food. I always stress about making sure we have enough food though logically I know we’ll have leftovers taking over the fridge. But it was wonderful to have family together for my favourite holiday. With trying to branch out in our cooking and the gluten free experiment I have to get creative in how I use the ingredients. That includes trying to use veg that I really don’t like. Being a supertaster I’ve been limited because things like squash, sweet potato, zucchini, etc can be bitter to me. Fortunately I’m having success in making these ingredients palatable for me but still letting some of that flavour that my family likes through. Which is great because I’d love to be more seasonal with the local foods. Kind of makes me wish I tried this before! There was some sweet potato and rutabaga in the fridge that needed to be used up plus a bin full of apples. I chopped up the sweet potato and rutabaga and covered with two cups chicken stock and 1 cup water. Cook on a high simmer until they are about half cooked. Add some sage and lemon thyme and one chopped apple. Finish cooking the sweet potato and rutabaga. While this is cooking, brown the pork in a skillet and finish it by baking. Mix some olive oil, lemon juice, and salt and pepper. Set aside and chop up some mustard greens. In a food processor spoon in the sweet potato, rutabaga, and apple leaving the liquid in reserve. Add 1/4 cup of dry white wine. Pulse while adding the cooking liquid a bit at a time until you get the consistency you want. Layer the pork over the puree and top with the mustard greens. Dress with the olive oil and lemon. It’s been a fun week so far. Last night a few of the ladies from our PTA decided we needed a girl’s night out. It was a lot of fun and we stayed out past 10 on a week night! LOL. Today our school put on a volunteer tea for those of us that have been volunteering with the PTA and other school activities. It was lovely with iced tea and baked goods. A treat in the middle of the week and I got to see the kids on an off kid week. Bonus! Now if the pending thunderstorms hold off until we get the dogs walked, well, we’ll just be riding high. I made our homemade pasta first so it was ready to go. I was pleased to see our sage was doing well again this year so I had some fresh sage at hand. The plants only last about three years or so. Peel and chop about 1/2 a cup of apple. Give the rest to the optimistic dogs at your feet. I swear the mantra is “drop it, drop it, drop it”. In a small bowl mix about a pound of the sausage, the apple, chopped sage, and salt and pepper to taste. Form the sausage into balls and heat up olive oil in a skillet. Brown both sides. Bake the meatballs at 375F/190C until cooked. In the meantime prepare the sauce. Chop up some onion and a couple cloves of garlic and saute in the pan that browned the meatballs. Slice up mushrooms and add to the mixture and saute for a few minutes. 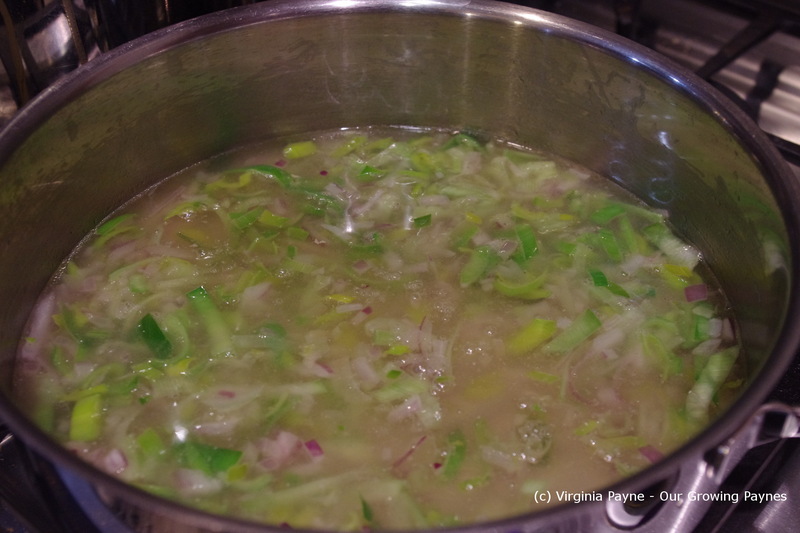 Add a cup of reisling and a cup of chicken stock and bring to a simmer. Reduce about a third. Add about 3/4 cup of milk or cream to the dish. Bring to a low simmer but do not boil. Add the meatballs and the cooked pasta. Grate fresh parmesan cheese over the dish and serve. I do like the pairing of sage and apple and it went well with the spice of the sausage. I wouldn’t say I’m a perfectionist because good luck with that. No one is perfect! But I really dislike not being really good at something. Needless to say it leads to disappointment. For example, you will never see me dancing and singing on stage. That is reserved for the car and the kitchen. I wish I was better at food photography. It’s strange because with everything else I can come up with some very good photos but I struggle with food. And plating. I can paint, create, design most things. Food? There is a mind block. Which is tricky when you have a food blog. 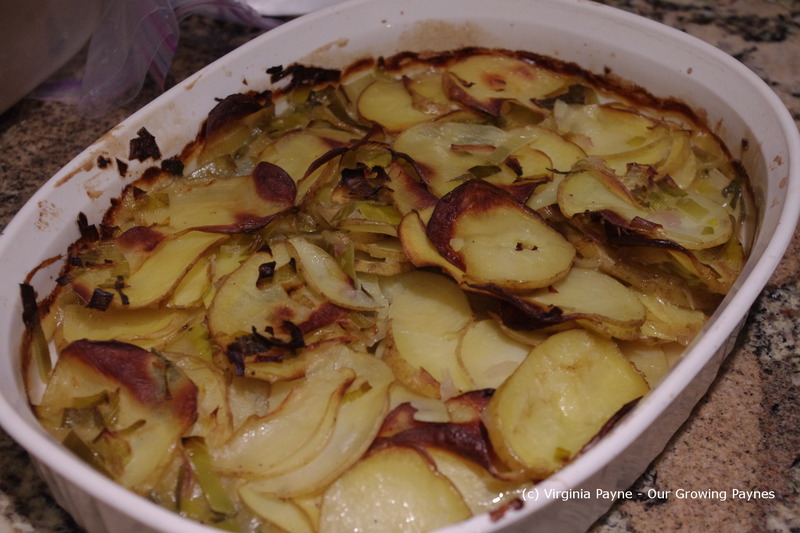 So imagine my envy when I came across Roger’s post for Pommes Boulangere. Granted he made a career doing this but I saw his food pic of the ingredients and just went wow. That is what I am looking to achieve. I immediately put photography books and food photography books on my Christmas list. This is my New Year’s resolution to improve in this area. It’s in my head but doesn’t always translate. Time to start thinking outside the box and just do it and practice. And the recipe? Had to try it. I admit for the first time I was hesitant to blog about a recipe that someone else did because of the difference in the photography but this dish is so delicious it outweighed my concerns. Preheat the oven 375F/190C. Avoid the convection on this one. I should have and you’ll see why below. 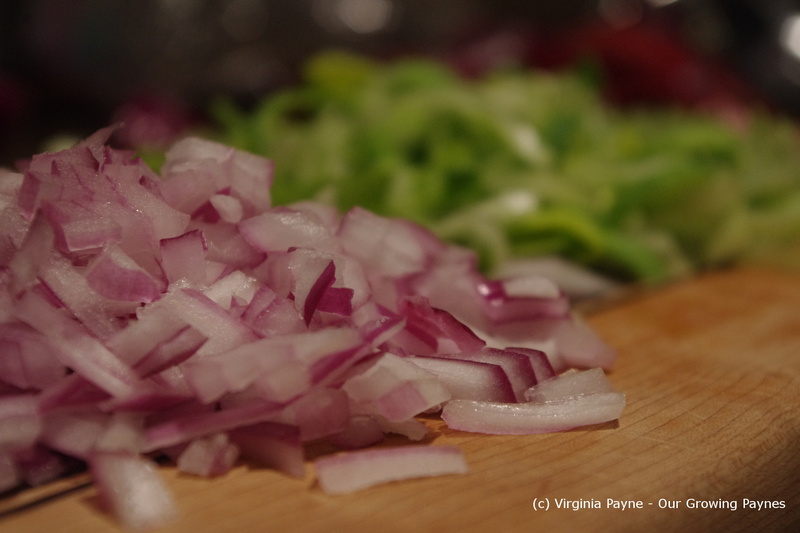 I finely chopped half an onion and thinly sliced about 1 1/2 cups of leeks. I use the green parts all the time. Lots of flavour and less waste. I took 3 potatoes and thinly sliced them. Quite the task when you don’t have a mandolin but I managed. 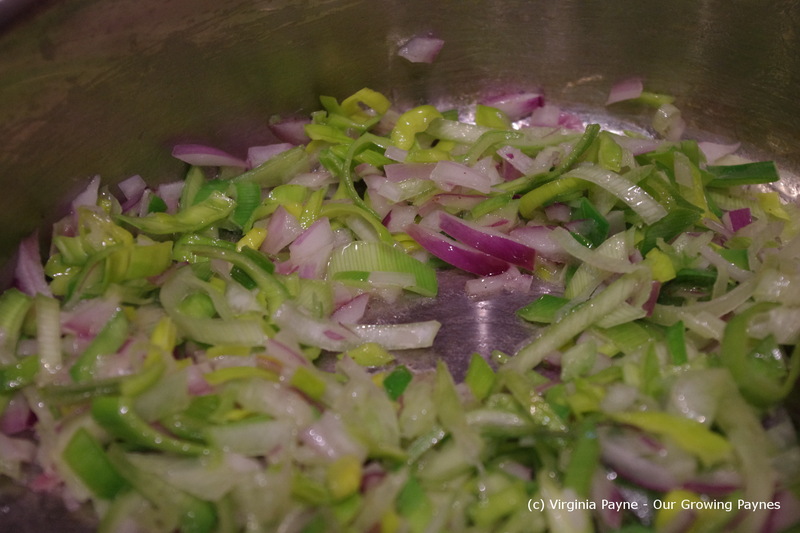 In a skillet melt 2T of butter and saute the leeks and onions until softened. Add a cup of homemade poultry stock. I used our turkey stock for this. Also add 1 cup of dry white wine and bring to a simmer. Season with salt and pepper to taste. The recipe calls for fresh thyme but I didn’t have any as ours is currently buried in snow. So I used some fresh sage we had on hand. 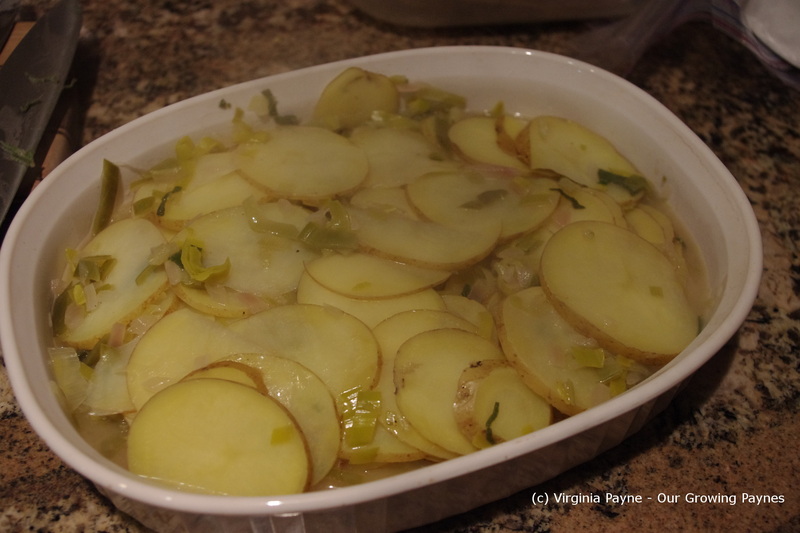 After simmering for a couple of minutes add the potatoes. Cook for 10-15 minutes covered. Pour into a shallow baking dish. Bake until potatoes are cooked and golden with most of the liquid absorbed. Here was my error in using convection. It got crispy too fast so I switched to regular baking. Covering would have helped as well. Live and learn! This makes a wonderful side dish. I must say though if you can, make it a day or two ahead. I found on the second and third day using up the leftovers that the flavours really melded together perfectly and it just got better and better.